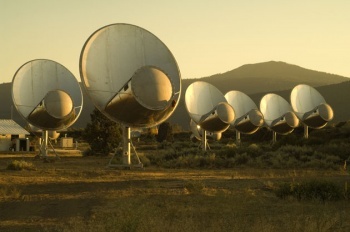 The Search for Extraterrestrial Intelligence may have come to an end if the public doesn't step in to help. One of the most burning questions that mankind has asked itself ever since we saw the stars above us for what they really were was "Are we alone?" Is there life - intelligent life - out there in the universe, or are we humans the only ones; a freak chance spinning through this cosmic ocean at thousands of miles a second? Aside from some occasional probably-false alarms, it's a question that has yet to be answered. And as of today, our most likely source for finding an answer is going offline: Funding cuts at the federal and state levels have led to the choice to shut down the Hat Creek Radio Observatory - and with it, the Allen Telescope Array that is the primary weapon of the Search for Extraterrestrial Intelligence (better known as SETI). According to the SETI Institute website, the Institute is currently exploring options to bring the ATA back online as soon as possible. One option is to lease the Observatory out to the United States Air Force to search the skies and map out the location of space junk, and perhaps keep looking for alien life in the meantime. Another option, however, is to seek money help from science-loving private citizens. This is a particularly devastating time to take SETI offline, reads the site, because the Institute was planning to take its powerful radio telescopes and examine the thousands of new extrasolar planets discovered by NASA's Kepler mission. Some of them are bound to be potentially habitable, no? The good news is that this is only a "hibernation" of the Observatory and the ATA - it could potentially come back online once (if) the nation squares out its budget issues. For the moment, though, if the Vulcans are beaming radio signals through space, our best chance of finding them is now off the grid. Read more about the ATA hibernation and SETI's plans here (PDF).